The economic crisis that began in 2008 revealed the numerous problems in our financial system, from the way mortgage loans were produced to the way Wall Street banks leveraged themselves. Curiously enough, however, most of the reasons for the banking collapse are very similar to the reasons that Long-Term Capital Management (LTCM), the largest hedge fund to date, collapsed in 1998. The Crisis of Crowding looks at LTCM in greater detail, with new information, for a more accurate perspective, examining how the subsequent hedge funds started by Meriwether and former partners were destroyed again by the lapse of judgement in allowing Lehman Brothers to fail. Covering the lessons that were ignored during LTCM's collapse but eventually connected to the financial crisis of 2008, the book presents a series of lessons for hedge funds and financial markets, including touching upon the circle of greed from homeowners to real estate agents to politicians to Wall Street. 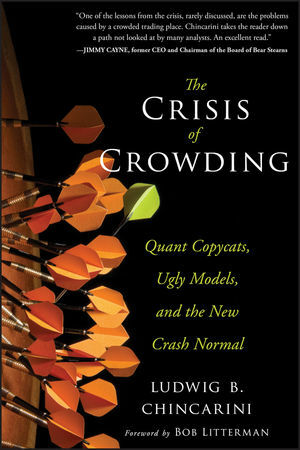 A unique blend of storytelling and sound quantitative analysis, The Crisis of Crowding is one of the first books to offer an analytical look at the financial crisis rather than just an account of what happened. Also included are a layman's guide to the Dodd-Frank rules and what it means for the future, as well as an evaluation of the Fed's reaction to the crisis, QE1, QE2, and QE3. Ludwig B. Chincarini, CFA, PhD, is an Associate Professor of Finance in the School of Management at the University of San Francisco and a member of the academic council of IndexIQ, with over fifteen years of experience in the financial industry specializing in portfolio management, quantitative equity management, and derivatives. He was Director of Research at Rydex Global Advisors, where he co-developed the S&P 500 equal-weight index and helped launch the Rydex ETF program. He helped build an internet brokerage firm, FOLIOfn, designing its innovative basket trading and portfolio management platform. He also worked at the Bank for International Settlements (BIS) and Schroders. He is the coauthor of Quantitative Equity Portfolio Management. He received a PhD from the Massachusetts Institute of Technology and a BA from the University of California at Berkeley.